There are so many reasons to be a lover of crustaceans, and right now it’s prime time to imbibe in the most popular delicacy of our seas. It’s easy to become a happy “crustaphile”, just hold a prawn up to your face, it’s even in the shape of a smile. I remember my first foray into becoming a lover of crustaceans. My Dad got pounds and pounds of prawns and brought them home for Mom to steam. With newspaper spread all across the kitchen, our family of eight circled around. With the bucket of steamed prawns piled high for the picking, eight sets of elbows poised for the attack. Diving in, us Minnesotans didn’t know what to do with their firmly attached exo-skins. Mom showed us how to peel the thin orange armor off, revealing the sweet meat underneath. Taking a cautious flavor savoring bite sixteen eyes popped open. Woohoo! Once we all got the hang of it, it was a frenzy. The four boys started popping the whole prawn in their mouths, dropping them from high above or pitching them in each other’s pie hole. Dad offered extra “atta boy” points if you dared to eat the tail, my sister and I scored. I will admit that I’m now fully allergic to crustaceans, but I still dream about them and want to tell you why I think you should eat them for me! Eating the tail of a prawn may benefit you Papa points, but eating the sweet, savory meat is good for you too. I have been very interested in the articles I’ve been reading lately on choline (yes, I am a self declared nutrition nerd). I am happy to tell you that choline, a little mentioned very essential nutrient, is found in crustaceans in great amounts. Your body does actually make some of its own choline but finding foods to focus on for this important nutrient is a good idea. Whole eggs and liver are awesome and finfish are great too but prawns weighing in at 115 mg per 3 ounce serving are fighting for their place in your choline favorites too. This nutrient is important for cell structure, function and signaling, the transportation of fat and for nerve transmission. Okay what does that mean in real time? It means a lack of Choline can lead to heart disease, liver disease and neurological disorders. There are studies out there that suggest a lack of choline can affect memory and may play a role in dementia. It has also been noted that it might play a role in cardiovascular disease prevention and possibly cancer and fatty liver disease. Most of us don’t get enough choline especially pregnant women. It’s critically important for the babies’ proper brain development and to prevent neural tube defects. This need continues even after the baby is born. The AMA has even recently signaled that choline content needs to be increased in today’s prenatal vitamins. Prenatally, early childhood, young women, men and older populations seem to need to focus on getting this nutrient through food the most. Wait a minute, isn’t that almost everyone? The bottom line is that we need more choline and happily being a crustaphile (a word I made up for the lovers of crustaceans), is a fun way to do that. 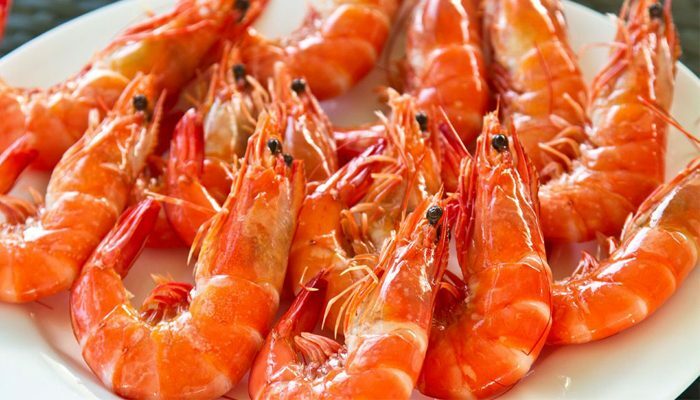 Chef Jeremy has some awesome tips on how to buy good prawns and shrimp (Chefs Blog) and our chef’s at Salty’s are offering you some fantastically delicious preparations of prawns this month. I hear the prawn and avocado bagette (Recipe) and our “jump in your mouth” prawns saltimbocca (Recipe) are some easily addicting choices.